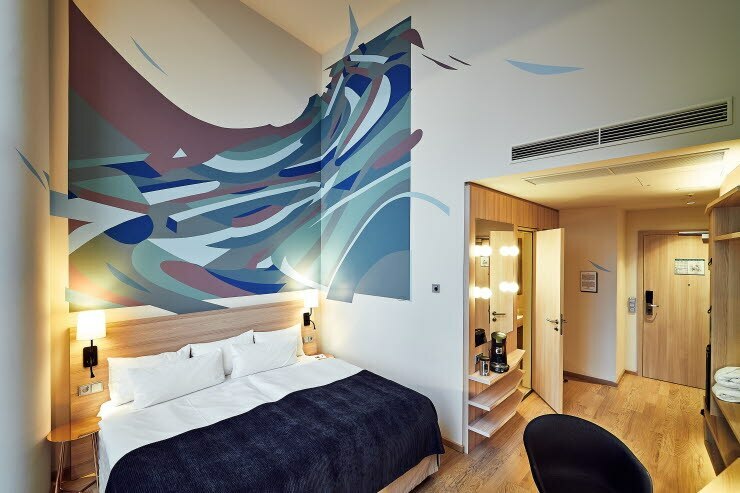 The graphic designer and artist Kera interpreted the theme of 'Water is life' in his own inimitable way when he brought an impressive, wave-shaped illustration to the walls of superior plus room 810. Born in Berlin in 1985, the artist Christian Hinz / Kera has dedicated more than 16 years to working with colours, printing techniques and facade designs. His love for tactile objects and artisan craftsmanship has consistently provided him with new inspiration. The link between working on the computer and translating the finished product to the wall delights both the graphic designer and the artist in him. The surface available for his work is never large enough. His graphic design studies and his passion for lines and surfaces is clearly visible in his work, as well as his years of experience with spray cans, wall paint and paintbrushes. His works are abstract but spatial at the same time. Graphic design and aesthetics play a huge role.